Long-tailed lizards are so named because their tails can easily grow to be three times the length of their bodies. These diurnal lizards are native to southeast Asia and are almost completely arboreal, or tree-dwelling. Long-tailed lizards move fast and are extremely agile, and enjoy a good long bask in the sun. Size: Long-tailed lizards can reach a full length of about 10-12 inches with around 3/4 of that length consisting of the tail. Long-tailed lizards can tolerate gentle handling, but you should never grab them by the tail. They can usually be housed in small groups, though males may fight if put in the same enclosure. These lizards are diurnal (meaning they're most active during the day) and arboreal (meaning they spend most of their lives in trees), and their gentle, easygoing nature make them suitable pets for both novice and experienced owners. A minimum of a 15-gallon tank is recommended for a single long-tailed lizard, with an additional five gallons for each additional lizard (i.e. a 20-gallon tank for two lizards). Since long-tailed lizards are so active, the larger the tank is, the better. A screen top should be used but it must be secure to keep these agile lizards from escaping. A mulch, peat moss, or forest bark type substrate is usually recommended since it helps retain humidity. Paper towels can also work for easy cleaning. Sand or wood chips are not recommended due to accidental ingestion and impaction concerns. Within the cage, you should provide a variety of branches, cork bark, plants (live or silk), and vines to provide lots of hiding spots and climbing space. A shallow water dish should also be provided for clean, fresh water. During the day you need to provide your long-tailed lizard with a basking spot of between 90 and 95 degrees, and an ambient temperature between 75 and 85 degrees to provide a proper thermal gradient. At night, temperatures should be between 65 and 75 degrees; if it's too much lower, your lizard may become ill.
Heat lamps with various heat bulbs or ceramic heat elements can be used to provide heat. Undertank heaters alone may not be sufficient to maintain ambient air temperatures for long-tailed lizards as these lizards spend a lot of time off the ground. At night, use a red or purple night time bulb or ceramic element if necessary (rather than a bright white light). Since they are diurnal, long-tailed lizards need exposure to full spectrum ultraviolet light. Use a UVA and UVB producing bulb designed for use with reptiles. Make sure the bulb is close enough to the lizards, but not so close it can cause burns. UV bulbs should also be placed over a wire mesh lid, not behind glass or outside a window. The glass will filter the invisible UV light the lizard needs. Maintain a humidity level of 70 to 75 percent in the tank at all times. Invest in a hygrometer to make sure your humidity level is at the correct level. A shallow water dish will help with humidity but daily misting of the tank with water or a reptile drip system (like chameleons use) is not a bad idea. Many long-tailed lizards will only drink from water droplets on the leaves in the tank. Crickets can be the main diet for long-tailed lizards, supplemented with mealworms, waxworms, butter worms, and flies for variety. Be sure your lizard's prey is gut-loaded before feeding. Adult long-tailed lizards can be fed several crickets every other day or so, while juveniles can be fed daily. Dust prey items with a vitamin and mineral supplement (including calcium and Vitamin D3) once a week. 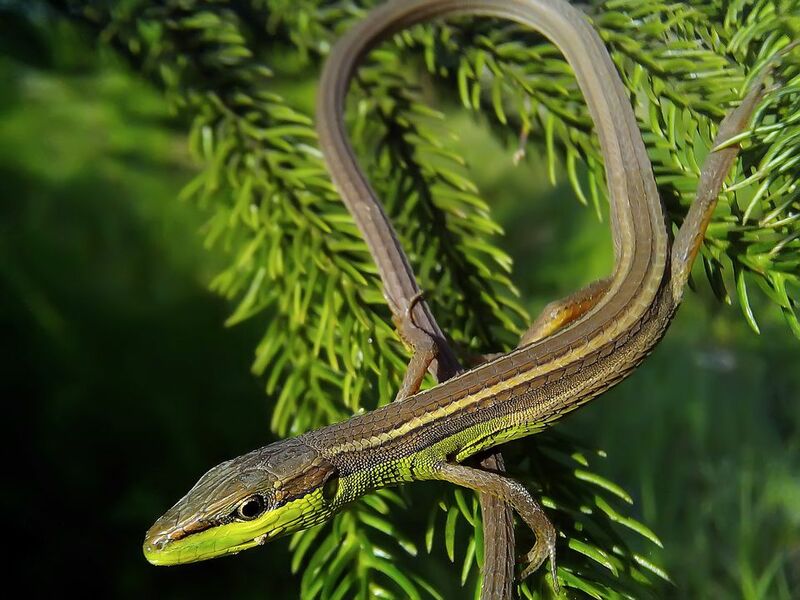 Wild-caught long-tailed lizards are most prone to parasitic infections, but their captive-bred counterparts will sometimes come down with a parasite as well. If you notice sluggishness, a lack of appetite, or vomiting, these symptoms may indicate a parasitic infection. External parasites also can be a problem, with ticks or mites biting the lizard's skin. Many breeds of lizard are susceptible to respiratory infections and the long-tailed version is no exception. Open-mouthed breathing, wheezing, and excess mucus around the nose and mouth are the most common symptoms of a respiratory infection, usually caused by improper humidity. The above medical conditions require a visit to a reptile veterinarian for treatment. Don't try to treat your lizard at home, or worse, ignore its symptoms. As with most exotic pets, but especially with lizards, you should acquire one that has been "ranched," that is, bred in a native but controlled environment. These are usually easily obtained from reputable breeders. This is better than bringing a wild-caught lizard home because you'll have an idea of what its health history is; wild animals are exposed to more parasites and other dangers. Long-tailed lizards have prehensile tails. Like monkeys and some other primates, these lizards can wrap their tails and hang by them if they choose, a fairly unusual trait in the reptile world. They are usually dark greenish-brown to brown on their back with a light (sometimes creamy white) belly. A brown stripe with a thin white or black border often runs down each side of the long-tailed lizard, though the coloration and stripe patterns can vary. And like the gecko, a long-tailed lizard can drop its tail when it feels threatened, and the tail will regrow. Obviously, it will take them longer to regrow their tails than some other, smaller lizards. Healthy long-tailed lizards have long tails, clear eyes, and skin and very alert personalities. They move fast, especially when feeling stressed or threatened, so if you encounter a long-tailed lizard that is sluggish, that's a signal that something is amiss. For other lizards similar to the long-tailed lizard, check out our other lizard breed profiles.